What is LIFE & LEGACY? 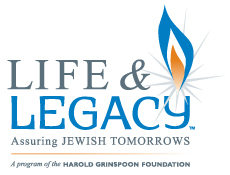 LIFE & LEGACY is a partnership of the Harold Grinspoon Foundation (HGF) and Jewish Federation & Foundation of Rockland County that promotes after-lifetime giving to benefit Rockland County’s synagogues, agencies, and other Jewish entities. Through training, support and monetary incentives LIFE & LEGACY motivates Jewish organizations to integrate legacy giving into their philanthropic culture in order to assure Jewish tomorrows. To cultivate a culture of legacy giving. To give generous and forward-thinking members of the community an opportunity to express their passion, purpose and commitment to the future of Rockland’s most valued Jewish organizations. In one way or another your life is rooted in Jewish experiences connecting you to the Jewish community. Chances are you already support Jewish charitable organizations in Rockland County, but have you included these organizations in your will or estate plan? By leaving a legacy, you can assure that the traditions and institutions that mean so much to you today will exist for future generations. By making your legacy commitment now, or sharing with the community that you have already done so, Rockland organizations to whom you make a legacy commitment have the opportunity to secure an incentive grant. All of us, regardless of age, wealth or affiliation, have the ability to leave a legacy. Your legacy gift of any size can be customized and structured to fit your dreams, lifestyle, family and financial needs. You can provide support for a particular organization or area of interest. Reflect on your Jewish passions. Contact one of the participating organizations. Have a conversation with a Legacy Team Member. Fill out a (Letter of Intent) form. Formalize your commitment by having a conversation with your personal financial advisor or attorney. The simplest method of leaving a legacy is through a will or trust. Or by adding or changing a beneficiary designation on a retirement fund or life insurance policy. Your legacy commitment can be a percentage or a specific dollar amount. You can establish an endowment with a contribution now or at the time your gift is realized. Some gifts can be structured to increase your current income. Please consult your professional advisor or Andrea Winograd at awinograd@holocauststudies.org or 845-574-40999 to determine which method of legacy giving is best for you.